You never fully appreciate sleep until you don’t get it anymore. It is hard getting into a good sleep routine with a newborn or infant. Luvs diapers has helped moms have more of a restful night sleep by helping baby have a peaceful night with their new Luvs with Night Lock diapers! 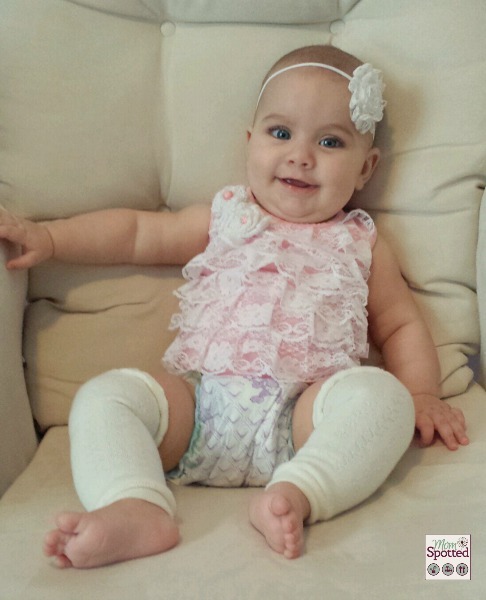 Leak Barrier Leg Gathers to ensure leaks are kept away from PJs and in our diaper – where they belong! Luvs with Night Lock isn’t available on retailer shelves until September 16th, but they are letting me give you an exclusive sneak peak, even before it becomes available! Luvs NightLock offers the ultimate overnight protection for baby. 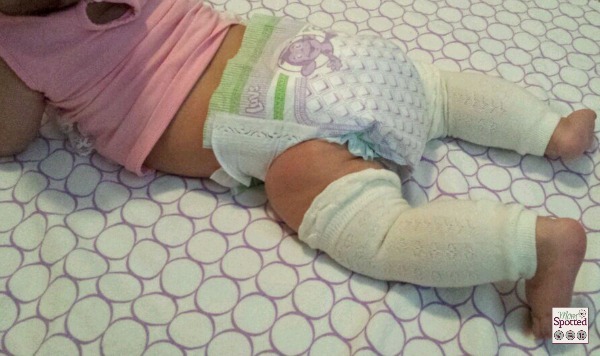 We used overnight diapers with my son and I remember them being bulkier. I wondered how Luvs diapers would be able to provide the absorbancy Halli needed at night when they are so thin. With the other diapers we were using before it wasn’t uncommon to pick her up for a night time feeding and have her feel wet. Her darn diapers had leaked! Poor girl was starving and she was also wet and need fresh pj’s and blanket. BUT! With Luvs Nightlock she has woken up dry!!! Luvs with NightLock has provided excellent protection against leaks. Halli also has chunkalicious legs. I love them so much, but it is hard to get a good fit around those chubby thighs. I was impressed by how Luvs with NightLock fit Halli. They were big enough to curve around her thighs and had enough stretch that they weren’t too tight. I love Luvs Diapers! I am so glad we haven’t had anymore issues with night time leaks. Halli and I are both able to get a more peaceful nights sleep. Luvs feels so strongly about their diapers, they guarantee them and have a Luvs Money Back Guarantee! Also, beginning September 16, 2013 Luvs will be offering print-at-home coupons on Luvs.com. Thanks Luvs! I love saving some money on diapers! On September 16th you can also see Luvs new series of the super cute and funny “First kid/Second kid” commercials on their YouTube page www.youtube.com/luvsdiapers. Right now one (1) Mom Spotted readers has the opportunity to win a Luvs NightLock Diapers in a SIZE 3. To enter use the Rafflecopter form below. Contest ends 9.16.13 at 11:59pm. For Official Giveaway Rules click here. yes they are great and affordable! We use Luvs now for my 3 month old. I started out elsewhere but thankfully learned quickly which diapers are the best! Yes I love them, they work great and are cheap! I use them all the time. It is the brand I prefer. I have used both pampers and buggies on my son and he has an allergic reaction to both. Luvs is the only one that he can wear. We LOVE them. Yes I have. I actually use cloth diapers but we use luvs when we are out and about . We have used them before. They worked great! I have. I like that they are very affordable! i have used them before they always kept baby dry and are affordable. I have used in the past. I love using Luvs! I used them on my kids and now my grandson. They work very well but would love to try the new Nightlock diapers, nothing wrong with using some added protection. We have, and i like them a lot. My son recently started wearing underwear during the day (hurrah!) but we are still diapering at night. 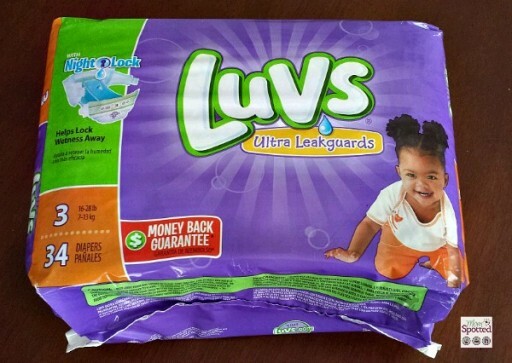 I never had an issue with overnight leaks from Luvs (or Target’s diapers, our other go to brand), but the two “big” brand diapers were terrible! We have never used Luvs. We have always used Huggies but I am definitely open to trying other brands! I used LUVS before. I thought they were more affordable than some of the other brands. Luvs are my go to brand, more affordable, but still great quality and no leaks. They are a great fit for long and lean babies too! I have not because never seen them in the store. i used them woth ds1 but had to switch when he started wetting more. now, id love to try them on ds2. tried Luvs with my 1st, didn’t like them – work great this 2nd time around – – lucked out with some hand-me-downs! Yes, I sure did with both babies. and Im planning on using them with this baby when he comes. Thanks for the chance. Sure I have used them, still use them!! To be honest- sometimes we buy diapers according to what is on sale that week! I have used luvs before and really like them. I have used Luvs many times! We like them a lot! I have used Luvs several times, they are a lot cheaper than other brands and don’t leak like Huggies. I haven’t tried luvs yet. But I also cloth diaper most of the time. I like to use disposables during the night and when we are traveling. I haven’t used very many brands, just what was given to us as gifts and when we have bought we have only purchased pampers as that is what we know (that is what the hospital used) I’d love to try luvs. Yes, I used Luvs with both of my oldest boys and now starting again with my youngest! love them! I’ve used luvs! They are affordable and they work really well. My son has Luvs on as we speak! We used Luvs all the time with our first daughter. I used them with my first daughter and we had no problems with them. Never tried Luvs. We typically buy generic store brand diapers because they’ve always been cheapest. I’d love to try some Luvs! Never used them but have new baby and need diapers!! heard they where the best! My first son is 1yr and 3mnths I have used luvs since he was born and my second son is 3 weeks and I plan to continue using luvs until they both grow out of diapers they are truly a great brand of diapers!! We love using Luvs!! I’ve never tried them before, honestly I don’t know why. No… we use cloth diapers. I used Luv’s when my children needed diapers (when I wasn’t using the ones that I laundered). Yes, we use Luvs regularly and love them. We haven’t tried LUVs yet because we don’t have any children. However, my husband and I are currently in the process of applying for foster care/ adoption from the state. If we get approved we are hoping to adopt two little ones. I haven’t used them before but I’m happy to try! I haven’t used them before because I’ve been using a cheaper brand that i’m not happy with. Yes, I have used them, and love them! I’ve used them and they are great! i have always loved luvs, they seem to be pretty leak proof and will use them again with my new baby on the way. Yes we use Luvs!!! They are the best!! I have used Luvs, they are what I used on my son and my grandson and now my granddaughter! I use Luvs often, they are affordable! I use them sometimes.. I have 2 in diapers. My niece does! THey are great! My daughter is 4 months old. I have been using Luvs for the past 2 months and I love them! They are very absorbent and can hold her #2 very well. However, part of the tab is made of a hard plastic and it caused a paper cut type wound on one of her legs 🙁 I just want Luvs and other moms to be aware and I wonder if this has happened to any other babies? ?